Abstract: Oracle Enterprise Manager offers an end-to-end solution for automated provisioning and lifecycle management of the whole system stack, including physical and virtual infrastructure. In this Oracle/Dell Inc. joint session, learn how the Oracle Enterprise Manager 11g provisioning and virtualization management packs can save time and money by automating the provisioning and management of the infrastructure of internal cloud services of IT organizations. It focuses on how to automate some time-consuming and error-prone tasks such as provisioning the Oracle VM environment, provisioning Oracle Real Application Clusters (Oracle RAC) 11g Release 2, converting a single-node database to Oracle RAC, and extending an Oracle RAC database. Recently I was interviewed by Oracle Magazine’s Peer-to-Peer column. 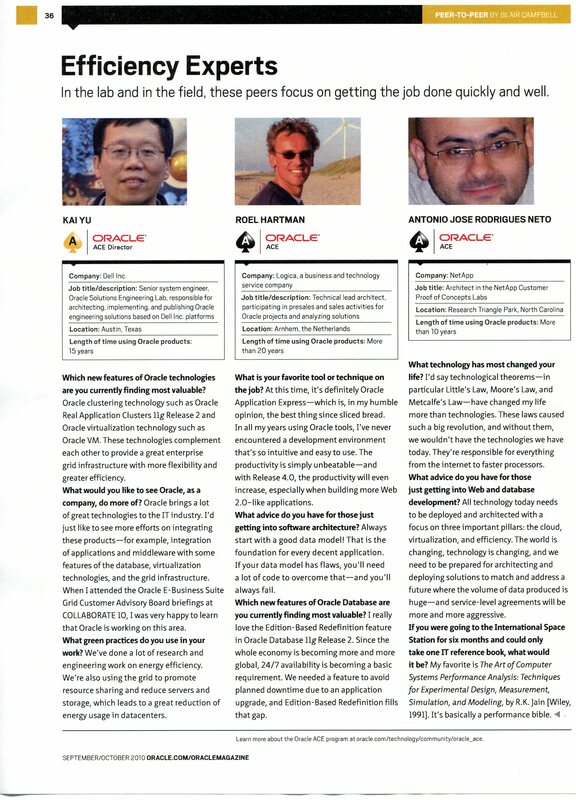 The interview was published in Oracle magazine September/October 2010 issue. The following is the Peer-to-Peer column page of this issue. The digital version of this issue of Oracle magazine is Here.